This report is a contribution to the public debate in the Kurdistan Region of Iraq (KRI) about crucial aspects of the current economic crisis and the Kurdistan Regional Government’s (KRG) immediate response. In addition, it looks at the impact of four different policy options, such as a.) independence b.) rapprochement with Baghdad c.) macro-financing from International Stakeholders and d.) macro-financial assistance from Regional Stakeholders, may have in averting an economic meltdown in the short-term, on the assumption that the oil prices will remain suppressed for the foreseeable future. This report argues that it is only when the economic meltdown is averted in the short-term that the KRG will be able to proceed with deep structural reforms in the public sector and start working on the diversification of the economy. After evaluating the pros and cons of the different policy options, the main argument is that the KRG needs to opt for macro-financial assistance from international stakeholders, such as the International Monetary Fund (IMF) in the shortrun and the European Union (EU) at a later stage. The main advantages of this option are the following: the KRI could receive conditional preferential loans with low interest rates with the objective of restoring liquidity in the private sector, restarting vital public projects and restoring consumer confidence by paying a higher portion of public employees’ salaries. Equally, international stakeholders will be able to monitor the process of stabilisation and provide direction and know-how in fighting corruption and diversifying the economy. The main challenge, however, is that the KRG leadership would have to change course in terms of its political objective of independence in the short-term at least. It appears that neither the United States (US) nor the European Union (EU) might commit such funds to Erbil unless it demonstrated goodwill for rapprochement with Baghdad. The alternatives seem not to be relevant to the KRI’s current economic needs. Independence is a long-term project that would require prior endorsement from international and regional stakeholders. Rapprochement with Baghdad alone is not enough as 17% of the depleted Iraqi budget cannot meet the KRI’s financial needs. Finally, macro-financial assistance from regional stakeholders can only be considered as a complimentary solution due to the political, security and economic challenges that it poses. All things considered, the current debate in the KRI is not sustainable; political and economic debates are carried out in a disconnected manner. The KRG’s immediate priorities should be a reflection of a coherent and unified strategy balancing political objectives and economic necessities. Accordingly, the KRG and the political parties in Iraqi Kurdistan need to connect the two in a pragmatic manner. 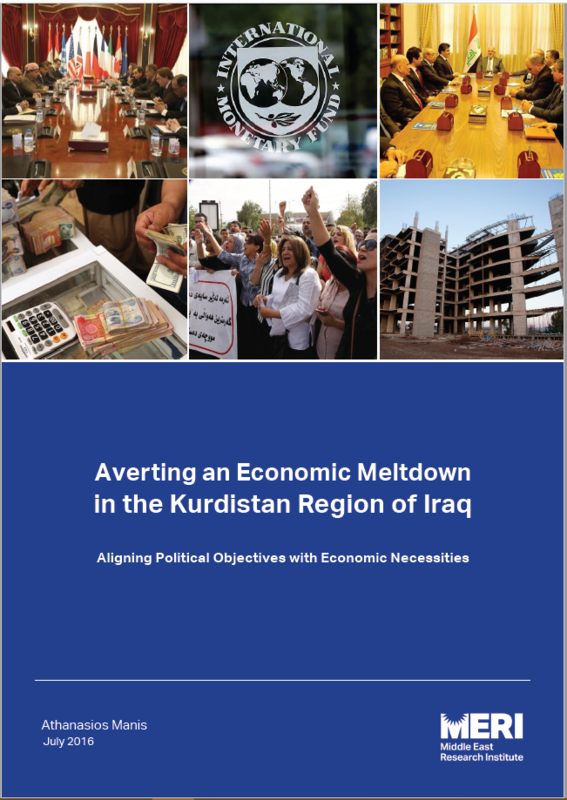 This report is a first attempt – and certainly not exhaustive – to raise governmental and public awareness of the need for a unified and coherent political and economic strategy to avert an economic meltdown in the KRI. Download the Policy Report in English with Arabic and Kurdish Summary. Is Austerity the Most Effective Policy to Solve the Present Financial Crisis?